We install more Cooking Appliances than anyone else in the UK. Our Team Knowhow experts are fully qualified electric installers and will install your cooking appliance professionally and safely. We’ll install your new cooking appliance at the same time as delivery. Visits from our delivery & install experts are available on any day of the week, for most of the UK. If you’ve already had your new cooking appliance delivered, we can still install it for you - even if it was bought from somewhere else. If we’re bringing and fitting an electric cooking appliance, but your old one is gas please place your order and call us on 0344 561 1234 to make sure we send one of our Gas Safe registered experts to safely remove it. *Please note if you’re purchasing a freestanding appliance with installation we will not be able to disconnect an integrated appliance. You’ll need to contact us to book a separate service or alternatively this will need to be disconnected prior to installation. Perform a full health and safety check, making sure that the clearances above and around the cooking appliance are suitable, and that the isolation switch is easily accessible and away from the heat zone. We’ll un-box the new appliance and check it is free from damage. If there;s an existing cooking appliance we’ll disconnect it. Evaluate and connect to the existing connections if they are suitable and meet the correct legal requirements. Test the cooking appliance to make sure it's fully working and operational. Then test the independent electric cooking appliance circuit. Provide a copy of the Electric certificate1. This verifies that the cooking appliance is safe to use and all safety checks have been done. Electric cooking appliance installations also include the correct cable up to 1.5 metres in length as part of the service. If you need us to disconnect a gas cooking appliance, please let us know by calling our UK Contact Centre on 0344 561 1234 after booking your installation online. We’ll then send one of our Gas Safe registered engineers. Electric cooking appliances over 3kw require a 16Amp or 32Amp fuse on a dedicated cooking appliance circuit. This is, usually, identifiable by a big red isolation switch and needs to be within 2m of the location of your cooking appliance and not directly above or behind the hob area. Some of our range of single built ovens are below 3kw and can go on a standard 13Amp fuse so do not require the isolation switch. These will require an electrical connection with 1.5m of the cooking appliance. The specification section on each of our products lists the electrical power rating along with the fuse requirement. Our product pages also let you know if the appliance comes with a plug fitted or if this should be installed by a qualified electrical installer, like one of our Team Knowhow Experts. 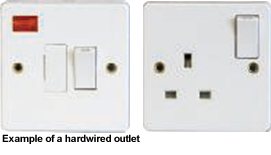 It must also be clear of any electrical switches, power points, alarm sensors or boilers. Any work surfaces directly next to the cooking appliance must be the same height or lower than the hob. Once you have purchased your new electric cooking appliance you will need to phone us on 0344 561 1234 and let us know if your old cooking appliance is gas so that we can assign one of our Gas Safe registered experts to safely, and legally, disconnect it and install your new cooking appliance at the same time. Add installation at the 'confirm basket' page when you order a cooking appliance online at Currys.co.uk. Already have a cooking appliance and want it installed? Call our Team Knowhow Contact Centre on 0344 561 1234. Please have your card details to hand when you call. Ask a store colleague to book the installation service when they arrange delivery of your new cooking appliance on a day to suit you.